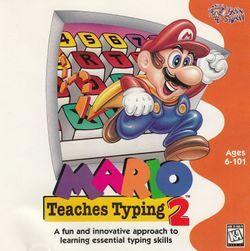 Mario Teaches Typing 2 is the sequel to Mario Teaches Typing. It was released on October 31, 1996. This sequel includes several new features, including a certificate of achievement, a keyboard that is color-coded for easy reference, an on-screen keyboard, specially customizable lesson plans, and new levels. Additionally, Mario's face also makes small talk with the player throughout the levels. Many of Mario's face's antics in this game are cultural references. This is also the last educational Mario game to be released. The Windows version of the game can be installed and will work on Windows 3.1, Windows 95, Windows NT 4.0, Windows 98/Me, Windows 2000, and Windows XP (32-bit versions only, the 64-bit Itanium version and Windows XP Professional X64 Edition for X86-64 based systems do not work as they lack the WOW subsystem to play it). It will not work under 32-bit versions of Windows Vista and above as it will have problems installing. The Mac OS version will work on System 7 all the way up to Mac OS 9. Compatibility is not guaranteed under the Classic environment of PowerPC versions of Mac OS X up until Mac OS X Tiger, as Mac OS X Leopard removed the Classic environment for PowerPC based systems. "The Magical Typewriter is the key to beating Bowser. You must type the magic words onto the scroll to cast the spell which will destroy Bowser's Castle. "Be forewarned, however, that if the magic words are not typed exactly, the Magical Typewriter will self-destruct into pieces." Before Mario can go on any further, the Magical Typewriter explodes into three pieces, which land in different places. One piece fell into the river, another fell somewhere on Mario and Luigi's side of the river, and the last one fell on the other side of the river. Mario and Luigi decide to recover all of the pieces and improve Mario's typing skills in order to type the spell correctly and ensure their victory. As Mario and Luigi get the first piece from a dim Koopa Troopa, a Red Koopa Troopa detonates the river bridge with TNT and takes one of the pieces back to Bowser's Castle. Mario then dons a snorkel and dives into the river attempting to get the piece that fell into the river. Luigi goes in also after defeating some Cheep Cheep that are attacking Mario. Mario and Luigi, in their snorkels, dive to a sunken ship in the river, taking the typewriter piece from a snoozing octopus. However, the octopus awakens and chases the brothers, though they escape through the ship's windows. Koopa Troopa paratroopa Bowser's Castle go kablooka! A giant typewriter suddenly falls from the sky and destroys Bowser's Castle. Mario and Luigi celebrate. Mario's Smash and Dash - for beginners. Mario's Wet World Challenge - for the intermediate typers. Mario's Tunnel of Doom - for the advanced players. Mario's Expert Express - the hardest level. 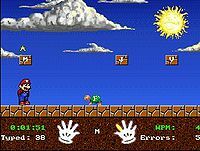 Mario thanks the player for choosing the game. Mario sings "That's Amore" for the player. His second line, "When an eel lunges out, and he takes a bite of your snout, that's a moray!" more resembles a parody of the song featured in Spider Robinson's book The Callahan Touch. Mario references a particular LifeCall commercial. Mario flies for the player. Mario says bye to the player. Mario's "I'm a videogame!" routine involves bouncing across the screen and making simplistic noises when hitting the sides, imitating Pong, an early arcade game. This page was last edited on August 14, 2018, at 03:43.